When I was little, I played with small plastic animals rather than dolls. My favorites were the horses, but I was happy with anything: cows, pigs, elephants, lions, fish, whatever. I would line up the animals in my room and lecture them. In first grade, I frequently tried to sneak an animal to school with me as a sort of pocket-sized security blanket. I always felt more confident when I had a little company within petting distance. 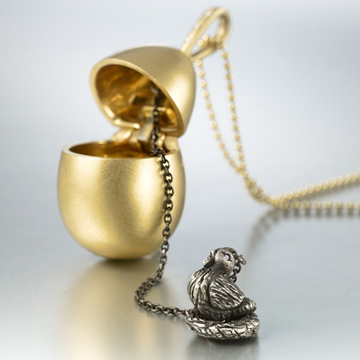 Click for more photos of my chicken-in-egg locket. 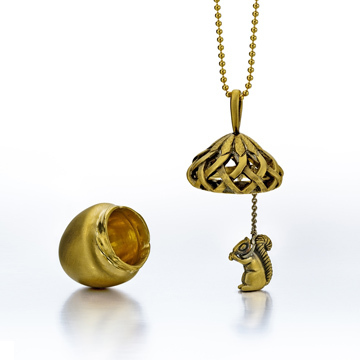 … and a gold acorn that houses a tiny gold squirrel. Click to see more photos of my acorn necklace. My love of tiny animal totems inspired my new jewelry collection: the Maneaters. 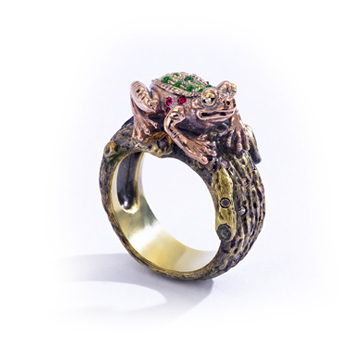 The first design for that collection — my 18K gold Frog and Prince ring — is January’s Jewel of the Month. This complicated piece took me a full year to complete. In October, I gave my Facebook followers a sneak peek of the frog. The green dots are ink showing where I was going to set gems. 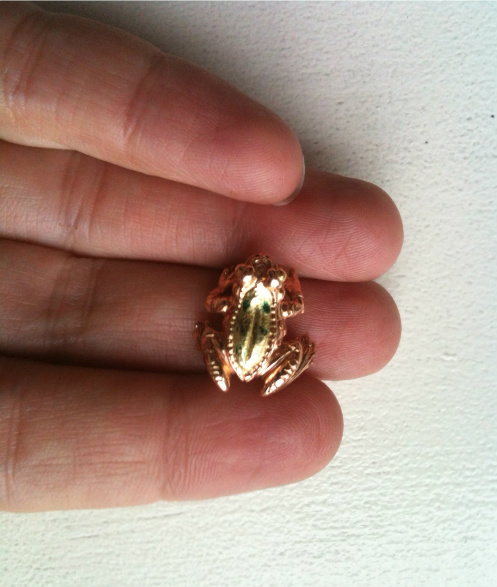 If you look closely at that picture, you’ll see the frog’s back is 18K green gold (which is actually yellow with a slight hint of green), while the rest of him is 18K rose gold. Here’s the same view of the finished frog. Photo by SquareMoose. Click to view on my website. … and he has diamond eyes. 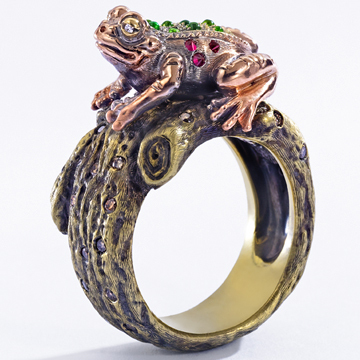 The frog is perched on an 18K-yellow-gold “branch,” which is studded with a third of a carat of brown diamonds. The influence of the 1980s dragon bell can be seen inside the ring, where I placed an 18K-white-gold carving of a prince with diamond eyes. 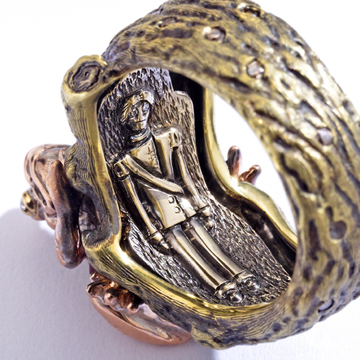 To sum it up, that’s four colors of gold (totaling 22.9 grams of gold), four different-colored gems, and a luxurious little frog “toy” that you can wear openly on your finger instead of hiding it in your pocket. I feel more secure already! 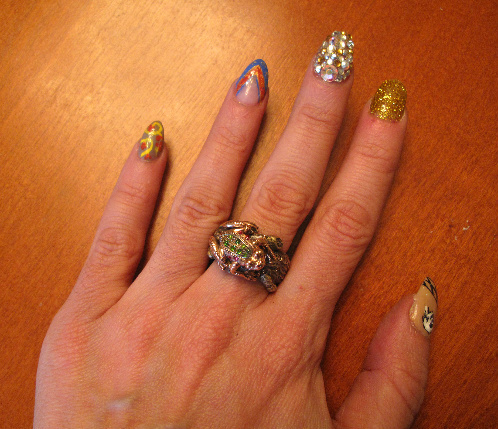 Click to read about my nails. 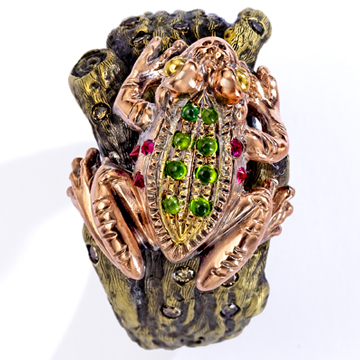 I’ve made only one Frog and Prince ring and the price is available upon request. 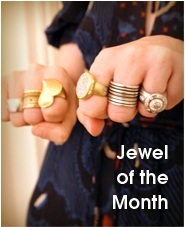 If you think you’re ready to splurge, email me at wbjewelry at hotmail dot com for more information. The wax models are ready for my next two Maneater rings, and now that I’ve finished the frog, I’m starting the metal work on the second design. I can’t tell you what that one is yet, but I can tell you what it’s not: a dragon and a knight. I’m saving that one for later! Absolutely adorable and incredible! There aren’t enough words to express how awesome the details of your jewelry are. So I’ll share a tidbit instead – my mom recently thrifted a little ceramic cat. She uses small pots to keep her jewelry out of reach of our thief cat, York. I found out when you lift off the ceramic cat’s head – he has a tiny mouse carved in his ‘tummy’. Wow wow wow. I love that there is a little secret inside. I have a little envelope necklace which I thought should have a letter. It didn’t come with one so I had to write one myself! And what did you write? Do tell! Very cool! I love all the texture you put into it. Very neat. 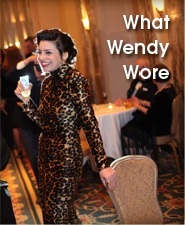 Love, love, LOVE this new design Wendy! It never ceases to amaze me just how intricate your designs really are…just when I think you can’t top a design, you do! One day I will be available to afford your fabulous high-end pieces…until then I’ll keep saving (next on my wish list is the chunky Juana skull ring!) and acquiring from your diffusion line! Chunky Juana is a good choice…I want to do one in gold ASAP! I love seeing what new and creative idea you will come up with next. Brava! 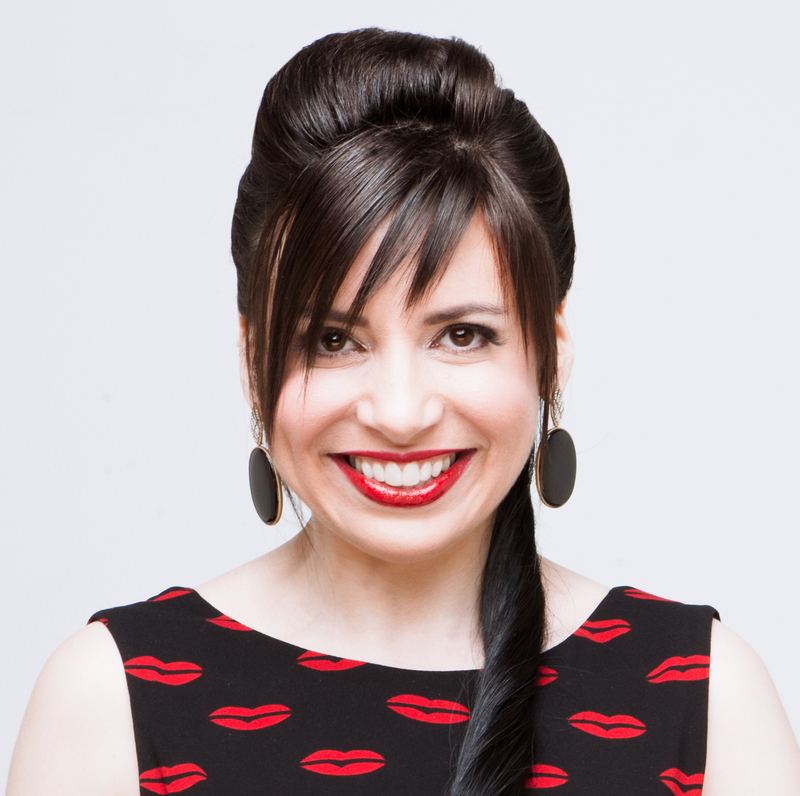 Thanks for sharing the poem…I keep rereading it! What a stunning piece! It’s so beautiful – you have the best ideas and designs Wendy but this one is just gorgeous. Stunning and full of heart. I love the jewels like droplets, the world-weary frog expression and curious angle of his head, the froggy toes, and the dear prince inside. Incredible work! Can’t believe I never read that poem before. Fantastic. Thank you, my dear! You’ll try it on in the summer over Pimm’s. Already got something better in the works. Email me! Fantastic! The prince inside is brilliant and makes me happy. You are such a design genius, and I love knowing a little background on your inspiration. So awesome. I LOVE all of the detail! Wendy, you outdo yourself with every new design. I love the exquisiteness and fun creativity of this new piece. Well done! That frog ring is awesome! Love the secret prince carving on the inside. Happy New Year! Seriously, Wendy- you are a genius. I wish I was a rich lady because my jewelry box would be overflowing with frogs, dragons and WTFs! This is the most adorable story I think you\’ve ever shared. The fact that you would line up your toy animals and lecture them is too cute to me. This ring is stunning, it\’s gorgeous and as with all your other pieces very detailed with an element of surprise. Love it. I’ve never seen anything that beautiful. You’ve outdone yourself.